For other uses, see Scandinavia (disambiguation). Scandinavia, Fennoscandia, and the Kola Peninsula. Flag of the Nordic Council. Late Baltic Ice Lake around 10,300 years BP, with a channel near Mount Billingen through what is now central Sweden. (Political boundaries added). 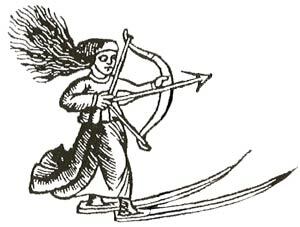 Hunting ski goddess, or Sami woman hunting on ski, from Olaus Magnus, 1555. The name of the Scandinavian mountain range, Skanderna in Swedish, was artificially derived from Skandinavien in the 19th century, in analogy with Alperna for the Alps. The commonly used names are bergen or fjällen; both names meaning "the mountains". Population density in the Nordic region (excluding Svalbard). Historically verified distribution of the Sami languages: 1. Southern Sami, 2. Ume Sami, 3. Pite Sami, 4. Lule Sami, 5. Northern Sami, 6. Skolt Sami, 7. Inari Sami, 8. Kildin Sami, 9. Ter Sami. Darkened area represents municipalities that recognize Sami as an official language. See also Politics of Denmark, Politics of Norway and Politics of Sweden. ^ Danish and Swedish: Skandinavien, Norwegian, Faroese and Finnish: Skandinavia, Icelandic: Skandinavía, Sami: Skadesi-suolu / Skađsuâl. ^ Scandinavia. (2006). Microsoft Encarta Online Encyclopedia. Retrieved January 30, 2007: "Scandinavia (ancient Scandia), name applied collectively to three countries of northern Europe—Norway and Sweden (which together form the Scandinavian Peninsula), and Denmark." ^ a b Olwig, Kenneth R. "Introduction: The Nature of Cultural Heritage, and the Culture of Natural Heritage—Northern Perspectives on a Contested Patrimony". International Journal of Heritage Studies, Vol. 11, No. 1, March 2005, pp. 3–7. ^ Peltonen, Arvo (2002). Politics and Society: The Population in Finland, Virtual Finland, Ministry for Foreign Affairs of Finland, Department for Communication and Culture, 21 November 2002, retrieved 14 Nov. 2006, paragraph 1: "The Finns form a distinct linguistic and ethnic group; the original Finno-Ugric population bearing features from both eastern and western Europe. Finland is an interface between east and west." ^ Oresundstid (2003). Scandinavism - the students. Retrieved 17 January 2007. ^ In response to Scandinavism, some Norwegian scholars of the 19th century resisted the idea that Scandinavia had a shared heritage and stressed the unique aspects that unit Iceland's cultural output exclusively with Norway and make it separate and unique. See for example Bothne, Gisle (1898). "The Language of Modern Norway". PMLA, Vol. 13, No. 3 (1898), p. 350: "[While it is true that] the old Norwegian literature was far behind the contemporaneous Icelandic literature [...], every Norwegian holds it to be equally true that the language of Norway and that of her colony Iceland [...] were substantially the same. Norroent mál, and the Norroen literature (created by conditions peculiar to Norway and Iceland alone) are the exclusive historical property of Norway and Iceland, while Denmark and Sweden have no part in them." ^ a b c "Facts about the Nordic Region and Nordic Co-operation". Nordic Council of Ministers, 1 October 2007. Retrieved 9 January 2008: "The Nordic countries consist of Denmark, the Faroe Islands, Greenland, Finland, Åland, Iceland, Norway and Sweden." ^ United States Government (2005). "Nordic Countries Report on Misconduct Activity in the 90's". The Office of Research Integrity, U.S. Department of Health and Human Services, Volume 7, No. 4, September 1999. Retrieved 9 January 2008. ^ United Nations Development Program. UNDP Nordic Office. Retrieved 9 January 2008. ^ "Finland and the Swedish Empire". Country Studies. U.S. Library of Congress. Retrieved 25 Nov. 2006. ^ a b "Introduction: Reflections on Political Thought in Finland." Editorial. Redescriptions, Yearbook of Political Thought and Conceptual History, 1997, Volume 1, University of Jyväskylä, p. 6-7: "[T]he populist opposition both to Sweden as a former imperial country and especially to Swedish as the language of the narrow Finnish establishment has also been strong, especially in the inter-war years. [...] Finland as a unitary and homogeneous nation-state was constructed [...] in opposition to the imperial models of Sweden and Russia." ^ "The Rise of Finnish Nationalism". Country Studies. U.S. Library of Congress. Retrieved 25 Nov. 2006: "The eighteenth century had witnessed the appearance of [...] a sense of national identity for the Finnish people, [...] an expression of the Finns' growing doubts about Swedish rule [...] The ethnic self-consciousness of Finnish speakers was given a considerable boost by the Russian conquest of Finland in 1809, because ending the connection with Sweden forced Finns to define themselves with respect to the Russians." ^ Seppälä, Matti, ed. (2005). The Physical Geography of Fennoscandia. Oxford University Press, 2005, pp. XI, 1. ISBN 0199245908. ^ Scandinavian Peninsula. Encyclopædia Britannica. 2007. Encyclopædia Britannica Online. Retrieved 1 February 2007. ^ Naval Intelligence Division (1920). A Handbook of Norway & Sweden By Great Britain. Published by H. M. Stationery office. ^ Scandinavia (2001). The Columbia Encyclopedia, Sixth Edition. Retrieved 2 February 2007. ^ "Scandinavia" American Heritage® Dictionary. Retrieved on 2007-12-15. ^ See also EU documents, such as the following report in SwedishPDF (1.67 MiB), report in DanishPDF (1.70 MiB) and bulletin in German. ^ "Nordic". In Merriam-Webster Online Dictionary. Retrieved 9 January 2008. ^ a b c Østergård, Uffe (1997). "The Geopolitics of Nordic Identity – From Composite States to Nation States". The Cultural Construction of Norden. Øystein Sørensen and Bo Stråth (eds. ), Oslo: Scandinavian University Press 1997, 25-71. Also published online at Danish Institute for International Studies. For the history of cultural Scandinavism, see Oresundstid's articles The Literary Scandinavism and The Roots of Scandinavism. Retrieved 19 January 2007. ^ Hans Christian Andersen and Music - I am a Scandinavian. The Royal Library of Denmark, the National Library and Copenhagen University Library. Retrieved 17 January 2007. ^ Scandinavian Tourist Board. Official site. ^ The Scandinavian Tourist Boards in North America. Official Website. Retrieved 2 February 2007. ^ a b c Helle, Knut (2003). "Introduction". The Cambridge History of Scandinavia. Ed. E. I. Kouri et al. Cambridge University Press, 2003. ISBN 0-521-47299-7. ^ a b c Old Frisian "se". "Comments on Indo-European reconstruction". The Indo-European Dictionary (IEED). Retrieved 2 October 2007. ^ Lundgreen-Nielsen, Flemming (2002). "Nordic language history and the history of ideas I: Humanism". In The Nordic Languages: an international handbook of the history of the North Germanic languages. Eds. Oskar Bandle et al., Vol I. Berlin and New York: de Gruyter, 2002. ISBN 3110148765, p. 358: "The term 'hyperborean' has been taken from odes by Pindar and Horace, literally meaning 'people living north of the north wind (Boreas). [Olaus Verelius, the founder] perpetuated Johannes Magnus' viewpoint that human culture began in Sweden with the Goths; [...] The height of the nationalistic theory of Gothic origins can be found in the work of Olof Rudbeck". ^ Malone,Kemp (1924). "Ptolemy's Skandia". The American Journal of Philology, Vol. 45, No. 4. (1924), pp. 362-370. ^ Björkman,Erik (1973). Studien über die Eigennamen im Beowulf. M. Sändig, ISBN 3500284701, p. 99. ^ a b North, Richard (1997). Heathen Gods in Old English Literature. Cambridge University Press: 1997, ISBN 0521551838, p.192. ^ Svennung, J. (1963). Scandinavia und Scandia. Lateinisch-nordische Namenstudien. Almqvist & Wiksell/Harrassowitz, 1963, pp. 54-56. ^ a b J. F. del Giorgio (2006). The Oldest Europeans: Who Are We? Where Do We Come From? What Made European Women Different?. A. J. Place, 2006. ISBN 980-6898-00-1. ^ Sammallahti, Pekka, 1990. "The Sámi Language: Past and Present". In Arctic Languages: An Awakening. The United Nations Educational, Scientific and Cultural Organization (UNESCO). Paris. ISBN 92-3-102661-5, p. 440: "we do not know of any linguistic groups in the area other than the Uralic and Indo-Europeans (represented by the present Scandinavian languages)." ^ Heine, Bernd and Tania Kuteva (2006). The Changing Languages of Europe. Oxford University Press, 2006, ISBN 0199297347. ^ Jónsson, Jóhannes Gísli and Thórhallur Eythórsson (2004). "Variation in subject case marking in Insular Scandinavian". Nordic Journal of Linguistics (2005), 28: 223-245 Cambridge University Press. Retrieved 9 November 2007. ^ Torp, Arne (2004). Nordiske sprog i fortid og nutid. Sproglighed og sprogforskelle, sprogfamilier og sprogslægtskab. Moderne nordiske sprog. In Nordens sprog - med rødder og fødder. Nord 2004:010, ISBN 9289310413, Nordic Council of Ministers' Secretariat, Copenhagen 2004. (In Danish). ^ "Urban misunderstandings". Norden This Week - Monday 01.17.2005, Nordic Council and the Nordic Council of Ministers, Copenhagen. ^ a b c d Inez Svonni Fjällström (2006). "A language with deep roots".Sápmi: Language history, 14 November 2006. Samiskt Informationscentrum Sametinget: "The Scandinavian languages are Northern Germanic languages. [...] Sami belongs to the Finno-Ugric language family. Finnish, Estonian, Livonian and Hungarian belong to the same language family and are consequently related to each other." ^ See "Introduction: Reflections on Political Thought in Finland", p. 9: "Fennoman cultural nationalism put an emphasis on the education and elevation of the people, and it became the leading force in the university sphere and in the bureaucracy. In the late 19th century Fennoman politics were more exclusively concentrated on the language question, trying to replace Swedish with Finnish." ^ Kolehmainen, John Ilmari (1943). "Antti Jalava and Hungarian-Finnish Rapprochement". Slavonic and East European Review. American Series, Vol. 2, No. 2 (Nov. 1943), pp. 167-174. ^ See for example: Agrawal, Subhash. Finland: A Turnaround Success Story, The Financial Express, net edition, Mumbai, India, 1 Jul. 2004. ^ Act on the Autonomy of Åland. Published by the Parliament of Åland. ^ "Treaty of Copenhagen" (2006). In Encyclopædia Britannica. Retrieved November 9, 2006, from Encyclopædia Britannica Online. ^ The Monarchy: Historical Background. The Royal House of Norway. Official site, retrieved 9 Nov. 2006. Scandinavia Tours and Scandinavia Vacations: Scandinavia Tours and Scandinavia Vacations: Book a Scandinavian vacation or tour with Gate 1 Travel, the premier provider of Scandinavian tour packages. Tour Scandinavia, Russia and the Baltics on these escorted, motor coach bus tours including flights, hotel accommodations, transfers, transportation, meals and sightseeing. A professional English-speaking tour manager handles all of the group's needs throughout your tour of Scandinavia, Russia, and the Baltics. Scandinavia House is closed on Saturdays from June 30 through September 1. Scandinavia House is pleased to present eight episodes of the International Emmy Award-winning Danish crime drama The Eagle (Ørnen) during its annual summer TV series. Scandinavia House features regular programs for children and families in the Heimbold Family Children’s Learning Center, a colorful, welcoming environment where children ages 3 to 10 and their caregivers can learn about the history and culture of Scandinavia through books, toys, workshops, and parties.